The third book in the Vatta’s War science fiction series. In the previous book, an unknown enemy almost destroyed Vatta merchant family and their company Vatta Transport Ltd. Now, Kylara Vatta is determined to fight back and rebuild the family and the company. The book was just full of interesting female characters! Ky herself has mostly gotten over her insecurities and isn’t afraid to be in charge and make independent decisions. However, she can be rather abrasive and isn’t at all subtle about her goals. But she does the best she can in a very difficult situation. She, and by extension Vatta Ltd., has two merchant space ships. She has taken over the larger and armed ship while she’s given command of her original ship to her cousin Stella Vatta. The ships part ways because of trade, Stella following in Ky’s wake and trying to sort out the messes Ky has left behind. They stretch her diplomatic abilities to the max and she starts to doubt Ky. Perhaps not surprisingly, Stella starts to resent Ky and she’s also quite jealous of her. This is quite a departure from the previous book. There are also some very interesting repercussion from the previous book, which I didn’t see coming and which I quite enjoyed. But my favorite character was aunt Grace. The Vatta family considers her a doddering old aunt but secretly she’s much more! She’s protecting her niece and her family from assassins while trying to piece together the larger plot. There are a couple of other women among the other ship captains. One of them is even unlikable which is still pretty rare for a woman who isn’t an enemy. This was a fast-paced and very entertaining book. We get to see a couple of new cultures which I rather enjoyed, too. One of them requires politeness from everyone and has extreme consequences for who don’t. I also enjoyed the dog situation. However, one culture is distrustful of women in power which is, now, a bit tired trope so I didn’t enjoy that as much. 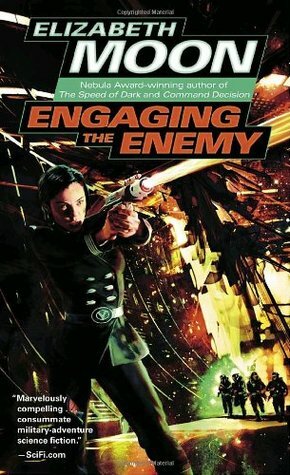 Engaging the enemy is actually my favorite book of this series, so far. That’s very good to know. Thanks!